The big news about DxO Optics Pro 9.5 is its seamless integration with Lightroom. But that isn't the only revelation making headlines with this release. The longer we play this game, the more obvious it is to us that your image editing software is not just some isolated island paradise but an island in a larger image processing archipelago (where the drinks should be free, considering how hard it is to get around). For photographers, Lightroom has become the main island for image ingestion, cataloging, evaluation, editing and output. Your archipelago may be centered around a competitor like Aperture, but we won't kid you. There are very few archipelagos. Still, there are islands where the beaches, shall we say, are cleaner. They simply outshine one or another closer-at-hand feature. Optics Pro certainly fits that description with its unique application of camera sensor and lens characteristics to image correction. Final Test Image. Easy passage from Lightroom to Optics Pro to Lightroom. But until today, we always felt we had to choose between processing our images in Lightroom or in Optics Pro. But today is different. With the release of Optics Pro 9.5, DxO has made it easy to tap into the program's special editing virtues without giving up the Lightroom environment. 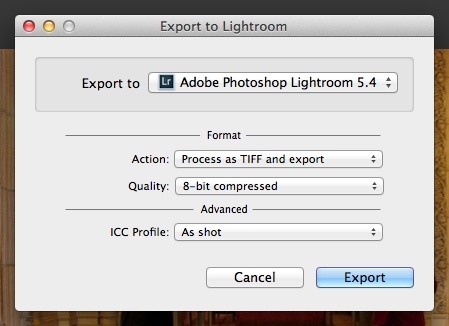 You could, it's true, export a Raw file from Lightroom to Optics Pro before but that required converting it to JPEG or TIFF image, which limited your options. You could not, for example, use Optics Pro's PRIME noise reduction technology, which requires the Raw file. With v9.5, you can export a Raw file to Optics Pro from Lightroom -- and even return a Raw DNG file. We attending a briefing on the update with DeMarcus Wood and Laurent Prost, Optics Pro product manager, and were able to test this new functionality with a beta copy of Optics Pro 9.5. Let's see how it work. The concept is powerful. It allows you to use Lightroom for its cataloging functions, editing and output options while you can rely on Optics Pro for its hardware-smart image corrections, denoising and distortion controls. That also includes Optics Pro's quick default improvements. As Prost pointed out, you can send a selection of images from Lightroom to Optics Pro for the quick default corrections and right back to Lightroom, rather than work on the images with Lightroom. After copying Optics Pro 9.5 to the folder on your hard disk with your other applications, launch it and it will immediately suggest you "Install the DxO optics Pro plug-in for Adobe Lightroom." 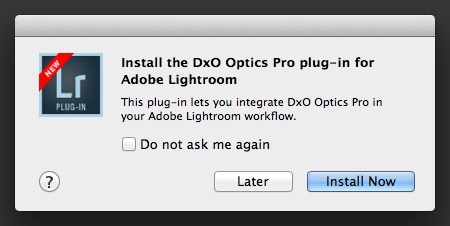 The same dialog box explains that the plug-in lets you integrate Optics Pro into your Lightroom workflow. 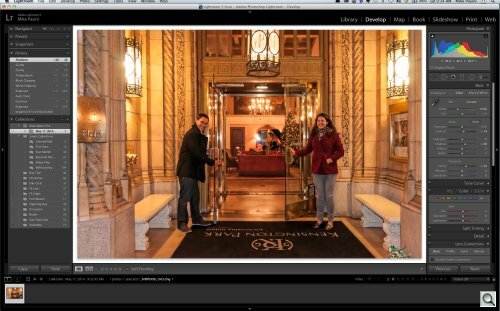 When you click OK, the Optics Pro plug-in is installed in Lightroom in the background. That's all there is to establishing the connection between the two applications. There's nothing at all to do in Lightroom. Outright prolonged applause. In Lightroom, you simply select an image (or images) and use the File>Plug-in Extras>Transfer to DxO Optics Pro command. 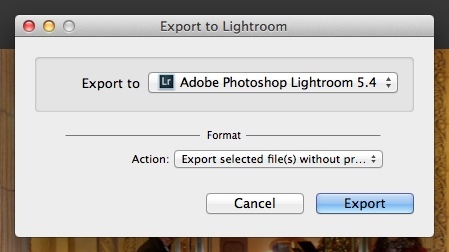 In Optics Pro, the Customize screen includes an Export to Lightroom button to return the image to Lightroom. There's also a link if you want more information about the process. Prost said it was important that "Optics Pro is the first program to process your Raw files." It's not only a Raw processor but it assumes the data in the file is generated by the camera. Otherwise the corrections based on sensor and lens data would be made to edits instead of the original data. So before you do anything with the image in Lightroom (other than ingest it, keyword it and rate it, presumably) send the Raw file to Optics Pro. The image arrives in Optics Pro in a project called Lightroom on the Customize screen and can be seen in the filmstrip. Metadata is preserved but it is taken from the XMP sidecar and not the Lightroom catalog. Optics Pro preserves the image's XMP and Exif metadata, including Lightroom star ratings and color flags. Optics Pro. The Export button. DNG, which exports a DNG file without tonal and color edits. JPEG Export. Quality, Profile options. TIFF Export. Quality, Profile options. DNG Export. Leaves your options open. So if your image is ready for output, the JPEG export may be all you need. If you want to retain the tonal and color edits you made in Optics Pro to the Raw file, you would prefer the TIFF export, which still leaves tone and color editable. And if you want to use Lightroom for your tone and color editing, a DNG export would be the ticket. When the image arrives in Lightroom, it appears as a new file with a DxO suffice in both an Optics Pro Collection and stacked with the original in the filmstrip. 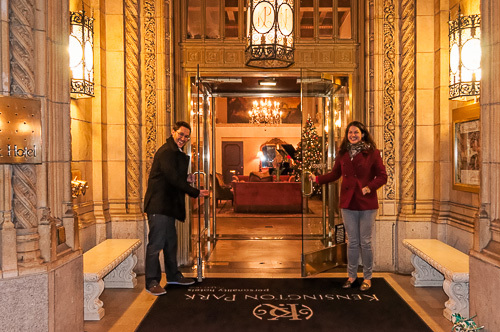 We found a Nikon D300 NEF Raw file shot Christmas night that needed a lot of work. It was noisy. It was skewed. It needed lots of help to revive the tone and color. Where We Started. Our NEF with no adjustments in Lightroom. The perfect job, in short, for Optics Pro. And Lightroom. We selected the image and sent it to Optics Pro, which was also open. Then we ran the lens corrections on it that we wanted, straightening it out and removing the distortions. When we were done, we exported it as a DNG. Optics Pro Edit. Everything straight, denoised. Back in Lightroom, we scratched our head. The tone and color adjustments we made in Optics Pro weren't retained. What must be clearly understood is that the DNG file we produce is "half-processed," without any color rendering applied. Lightroom must apply its own color rendering to the file to display it as an image and since it does not have the same color rendering as Optics Pro, you get a different result than in Optics Pro, even if all LR sliders are at their default values. This is the very reason why we advise our users to use DNG only when they want to do all their light and color processing in Lightroom. If you want to keep the image rendered the way you saw it in Optics Pro, then a 16-bit TIFF is the way to go. And, indeed, we made our final tonal and color corrections in Lightroom to the DNG file created by Optics Pro. Lightroom Edit. Our DNG file processed. Note the Collection and Filmstrip. As we said, we no longer feel the need to choose between processing an image in Lightroom or Optics Pro. 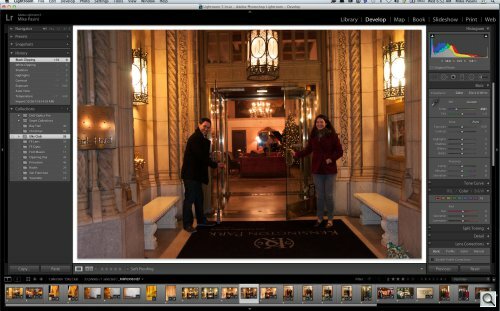 We can use the editing tools we prefer in Optics Pro without giving up the infrastructure Lightroom provides. It's a little like getting a lot better ferry service from one island to another in our image processing archipelago. 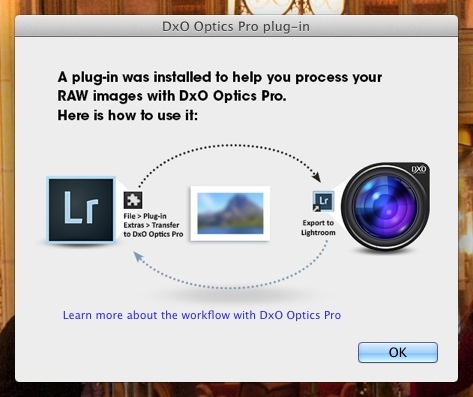 Now that you can send a Raw file from Lightroom to Optics Pro, we wondered if you can send a DNG file, too. After all, Optics Pro has recently begun reading DNG files that have been created in the camera. We asked Prost at the briefing and he said that no, you can't. DNG files that are created in the camera are supported but DNG files created by conversion from the native Raw format of the camera are not supported. The conversion, Prost said, changes how metadata is stored and Optics Pro is sensitive to that. But -- and here's another headline for you -- the company is working on parsing converted DNG files and it hopes to add converted DNG support in a future update. That's good news because it's not uncommon to standardize on the DNG format for Raw files, converting the camera originals on import. But once you do that, many of the best things about Optics Pro are no longer available, including PRIME denoising. Thanks for the great article. It answered all of my questions. I found it because someone put a link on Canon Rumors. I am using the 9.5 Elite trial version at this time with plans to purchase by July 15 to get the discount. I use X-Rite ColorChecker in Lightroom for color and white balance so I export as DNG from OP. One thing I noticed is the image sometimes comes out much brighter than what is displayed in OP. So I just process it again with the exposure/brightness turned down then export again. Since it's pretty fast I don't mine the extra steps for getting a better Raw conversion. Maybe if DxO would add color checker support I could export as Tiff and been done with Raw conversion. I've asked DxO about ColorChecker support. The DNG export would still not support any color or tonal edits from DxO, though (it's just the nature of the beast). 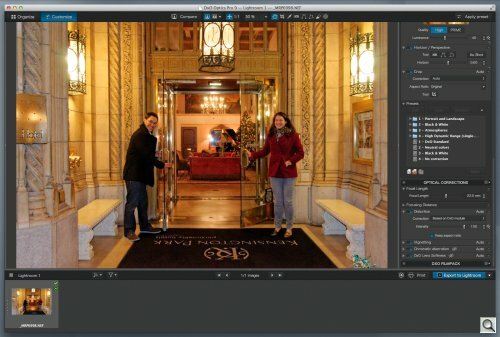 PARIS, France -- DxO Labs announces the immediate availability of DxO Optics Pro v9.5 for Mac and Windows, the latest upgrade of its image processing software of reference for all demanding photographers. DxO Optics Pro v9.5 offers a new image transfer feature that lets users process their Raw photos from Lightroom. Used in tandem with the Adobe software, DxO Optics Pro has definitively become the ideal solution when it comes to image quality. This upgrade also adds support for four new cameras as well as 165 new DxO Optics Modules. 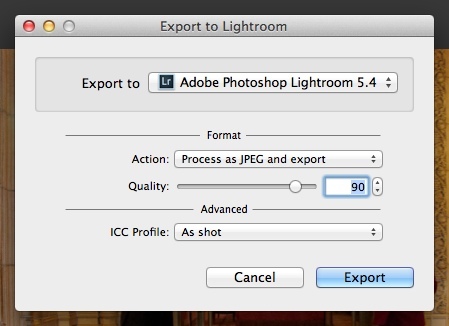 Until now, exporting a Raw image from Lightroom to another software application required first converting it to JPEG or TIFF format, which can reduce image quality. DxO Optics Pro v9.5 offers the first non-destructive workflow that is completely integrated with Lightroom. 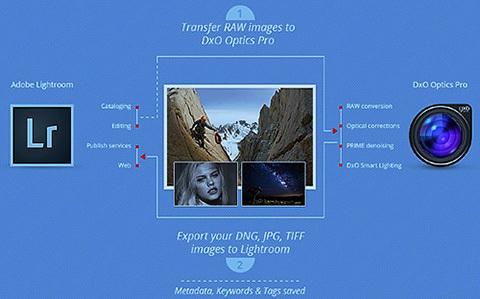 This very simple process lets users transfer their Raw images in one click from the Lightroom cataloguer to DxO Optics Pro, process them and then return them to Lightroom in DNG format, which retains the qualities of a Raw file so as to facilitate additional processing. The dual non-destructive flow gives users optimal flexibility right through to the final adjustments to their photos. The intelligent exposure optimization of its DxO Smart Lighting feature, which among other things allows for perfect recovery of highlights. DxO Optics Pro automatically adjusts all of these parameters to produce an optimized rendering during batch processing, thus saving users a significant amount of time. DxO Optics Pro. The first software to offer a ready-to-use solution for extracting Raw images from the Lightroom cataloguer that perfectly preserves the links between the original images and the processed images. With the aim of facilitating its workflow with Lightroom, DxO Optics Pro v9.5 offers greater compatibility with the XMP standard: star or color rankings stored in image metadata are now perfectly preserved during transfer. DxO Optics Pro supports most current camera models on the market. DxO Optics Pro v9.5 now handles Raw files from 4 additional cameras: the Canon PowerShot G1 X Mark II, the Nikon 1 V3, the Panasonic Lumix GH-4 and the Sony A6000. Finally, 165 new camera/lens combinations have been added to the library, which today counts more than 18,000 available DxO Optics Modules. Photographers who acquired a DxO Optics Pro 8 license on or after Sept. 1, 2013 are entitled to a free upgrade to version 9. To access DxO Optics Pro tutorials, webinars and the user guide, check out the DxO Academy.